I’ve come across two historical transportation stories. The train was packed as it pulled away from the station at 10:15 am, but around three miles out of the city a nightmare unfolded as the train was trying to pull up the slope out of Armagh, but was pulled back by its weight. A decision was taken to decouple the front four carriages, move them to Hamiltonsbawn, and then to return for the remaining eight carriages. Stones were placed behind the wheels of those carriages, but they rolled backwards, crushed the stones and began to build up speed as they continued back down the slope. The runaway carriages crashed into another train, resulting in the loss of 89 lives. All denominations suffered – Catholic, Church of Ireland, Methodist and Presbyterian. 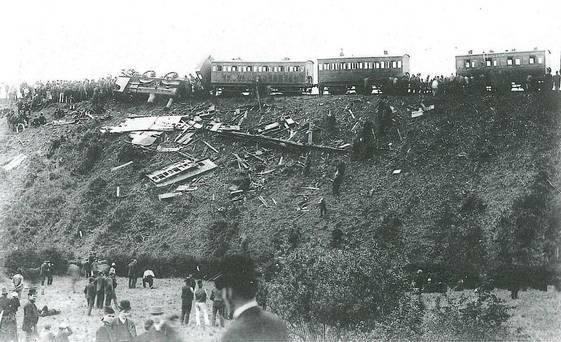 June 1889 rail disaster at Armagh. This August will mark the centennial of the death of John Phillip Holland, builder of the first successful submarine, known as the Fenian Ram. His experimentation began in Drogheda, County Louth. In America, a later design became the U.S. Navy’s first commissioned submarine, according to this story in The Irish Times. He died in August 1914, relatively poor, and just weeks before HMS Pathfinder became the first ship to be sunk by a torpedo fired by submarine – and nine months before a German U-boat set its sights on the Lusitania. This entry was posted in Business & Environment, History, Irish America, Northern Ireland and tagged Armagh, Drogheda, John Phillip Holland, Louth on June 17, 2014 by admin. FYI: You have a bit of incorrect information here. John Holland’s first sub was not the Fenian Ram. It was called the Holland I and after locating the 14 foot boat in 1923 local (Paterson NJ) students donated it to the Paterson Museum where it sits today next to the second boat Fenian Ram.